The Gay Gamer: #ADecadeofDS: Catch! Touch! Yoshi! Amount of time devoted to this DS game in the last week--One hour, 54 minutes. Overall comments on the experience--For starters, don't read too much into the time listed above. Catch! Touch! Yoshi! 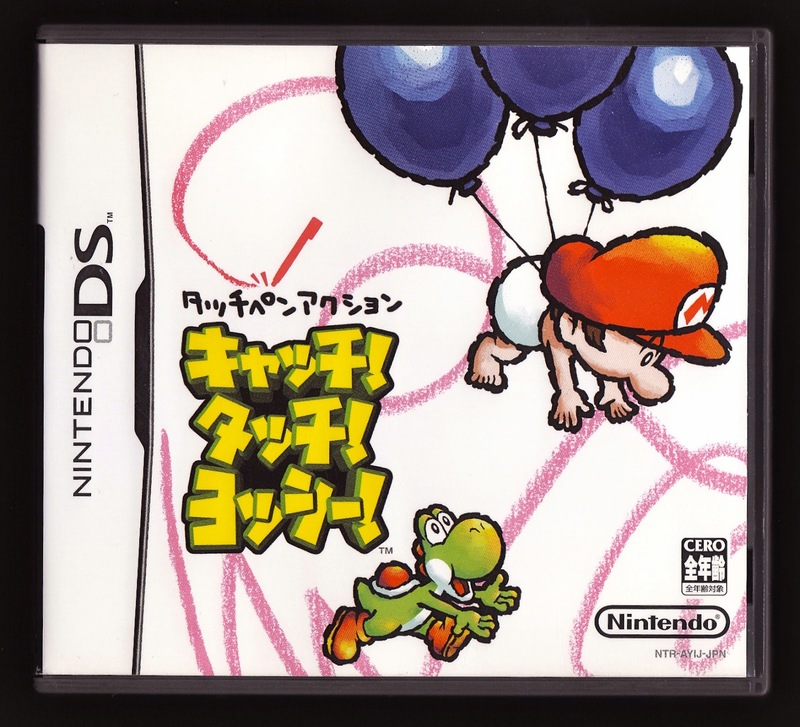 (Yoshi Touch & Go outside of Japan) isn't a game you play for hours and hours on end--or at least that's not how I played it. Instead, it's one of those games you put five or 10 minutes into while you're lazing away on the couch on a Sunday afternoon. Of course, it's possible I would've spent more time with Catch! Touch! Yoshi! over the last week if it had grabbed me from the get-go. Unfortunately, it didn't, and my first few stints with it left me thinking it just wasn't "my cup of tea"--or whatever the gaming equivalent would be. I stuck with it, though, in part because I felt I needed to give it a fair shake and in part because I found it to be pretty darn easy on the eyes, and I'm glad I did, as its unique, touch-screen-centric gameplay--which alternates between using a stylus to form cloud-puff paths for an airborne baby Mario and using it to guide an always-on-the-move Yoshi through a seemingly endless ground-based stage--eventually grew on me to a surprising degree. 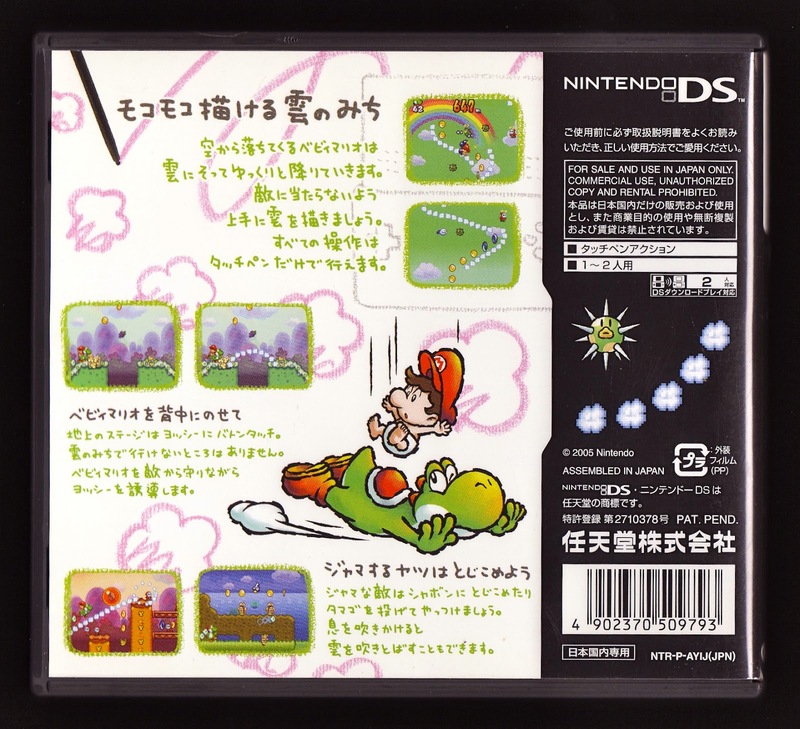 The game's "Score Attack" and "Time Attack" modes have proven to be my favorites, by the way, with the "Marathon" ("Endless" in the Japanese version) and "Challenge" modes being just a bit too tricky for me on most occasions. Unfortunately, each of these modes are so similar in terms of aesthetics and gameplay that they're nearly interchangeable--a fact that makes Catch! Touch! Yoshi! seem dangerously thin, content-wise. Still, there's obviously some good, almost "old fashioned" fun to be had here, and that shouldn't be overlooked--nor should the surprisingly attractive visuals that are on offer. (I especially love how the look of each "stage" slowly, but surely, morphs as the seconds tick away--from blue skies, to sunset, to nighttime and back again.) Add in what's sure to be an enticing price point--even for "complete" copies--and it's easy enough to overlook this cumbersome cart's handful of negatives. Will I continue to play this game in the coming days, weeks and maybe even months?--Yes, on and off. Mind, you, I'd be far more likely to play it on the regular if a digital version of it were on my 3DS at all times, but as it stands, this colorful cartridge will have to settle for only occasionally making the journey from its case to one of my treasured DS or 3DS systems. Do I recommend it to others?--It's kind of hard to say, actually. If 3DS owners could download Catch! Touch! Yoshi! 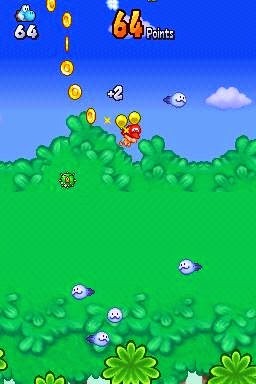 (or Yoshi Touch & Go) from the eShop for a couple of bucks, I'd throw my full weight behind it, as it's definitely the kind of game a lot of people would enjoy dumping a few minutes into when they have some free time. It's harder to recommend it, though, when playing it requires tracking down an actual cart that's unlikely to stay in someone's DS or 3DS for very long. Glad to hear you ended up warming up to it! I definitely agree it would be much more attractive as a download title and I keep hoping Nintendo will do that eventually, if only because I'm really curious how people might respond to it now that there are so many similar "infinite runner" type games out there. Ah, right, you were the one who pushed me to buy and play it way back when, right, Michael? Anyway, yes, I definitely warmed up to it after a few stints with it. In fact, I'm kind of sad that the cart's not likely to see the inside of my 3DS for a while, as I've got too many other games to play at the moment. That's why it would be so great to have it as an eShop title, as I'd definitely play it every few days if it were sitting on my 3DS' menu screen. BTW, I agree with you that it would be interesting to see how the game would hold up to other, more recent and somewhat similar titles--if Nintendo went ahead and offered it as a digital download, I mean. Since that's unlikely to happen anytime soon, all we can do now is speculate. I do think, though, that it's unique enough to stand out from the pack, especially with its Yoshi's Island aesthetic and mechanics. I've never really seen anything in-depth written about this game before, so it's nice to finally see what it's about! I have heard in brief exchanges, over podcasts or video discussions, though, how it seemed to be the "predecessor" to iOS games. Which is to say, before those ever really caught on, this game offered a similar style of pick-up-and-play that was previously not so common. Similar to what you said, it seems like this would be a great downloadable game! Thanks, Zach! Admittedly, I likely didn't do the best job of describing how this game actually controls/plays, but I'm glad my write-up still provided you with some useful/interesting info. Speaking of which, yes, this game is very much like any number of mobile games you'd see today, although of course with the "Nintendo touch." If it were released today, though, there's no question it would be a $5 (or less) digital/eShop release--unless, of course, Nintendo beefed up its content quite a bit. There's just not enough on offer here to justify spending more than about $5 on it (unless you like the packaging--in which case, it's probably worth about $10). Yeah, the visuals are really neat, but I think I might pass on this entry. I'd really like to finish Yoshi's Island (sigh) before I get around to more Yoshi games, too. It's a deceptively difficult game if you want to get all the flowers, stars, and red coins! That makes sense, especially if you've yet to finish Yoshi's Island. Also, yes, YI definitely is deceptively difficult, if you ask me.